Bird's Farm barn is one of the most important and interesting buildings in the village. Consequently we are grateful to Wendy and Simon Maddox for their permission to create this webpage. 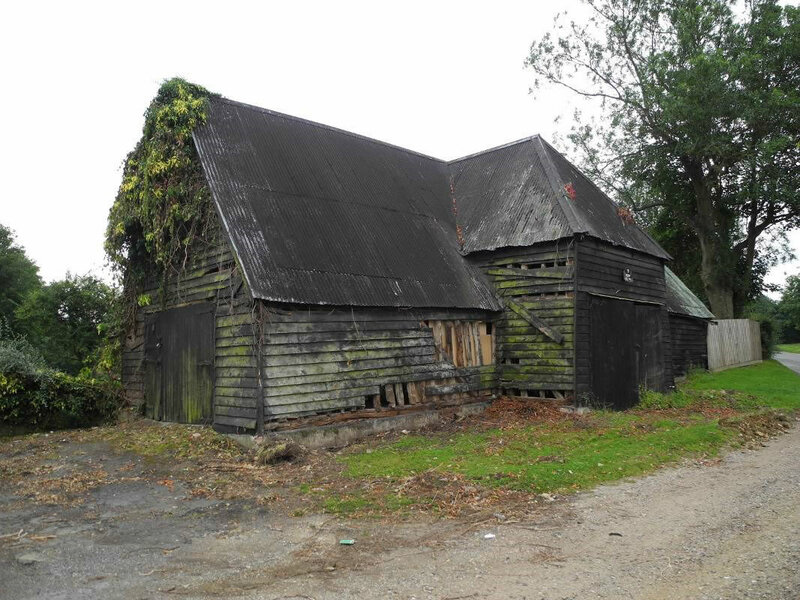 We wish to thank David Andrews of Essex County Council for his permission to reproduce his report written just before the barn was converted to residential use and also to Dr Ray Moore of University of York for his assistance. 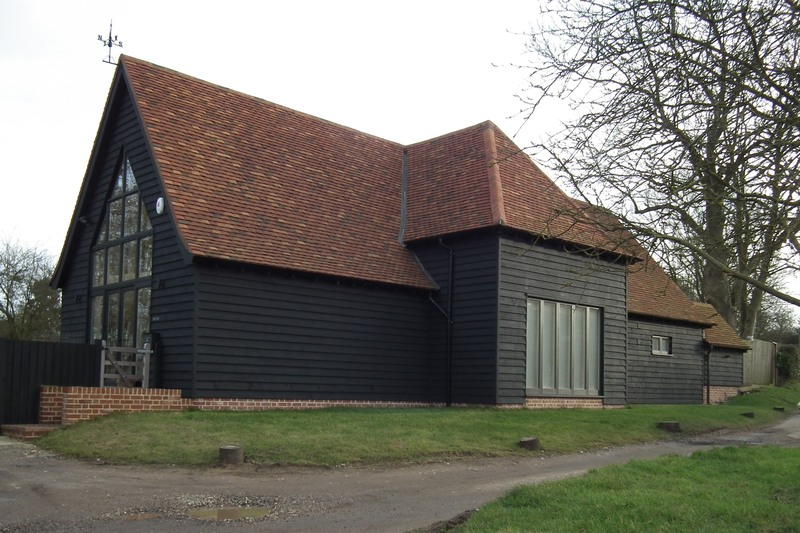 Birds Farm Barn is an early modern barn prominently located at the western entrance to the village. It stands close to the 16th century Bird's Farmhouse which is listed grade II, and hence is a curtilage listed structure. 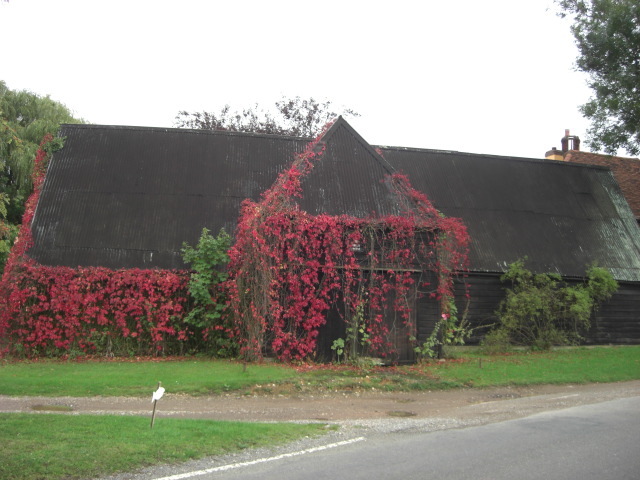 Planning permission and listed building consent had been obtained to convert the barn to residential use. Conditions attached to the consents include one requiring a programme of archaeological investigation before work starts. This report was prepared to satisfy that condition, and the criteria set out in a brief issued by Essex County Council Place Services. Early C17 timber-framed and plastered building. Two storeys. The upper storey is jettied on the south front and there is a later lean-to addition at the east end. Two window range, mainly casements. Roof tiled, hipped at the east and west ends. (RCHM 6). In 1977, John McCann wrote a report on the house for the owner (ERO T/P 250/7). He noted that the house was originally of three bays, two about 9ft wide and a middle one about 6ft. The middle one he interpreted as for a timber framed chimney later replaced by the existing brick chimney. Subsequently the house was enlarged by a bay on each end. He dated it to the 16th century. The apparent lobby entry plan however means that it must be late 16th century, whilst the crown-post roof indicates, in the present state of knowledge, that it is unlikely to be later than c.1575. The frame of the first phase of the house is of very substantial timbers which present a striking contrast to the framing of the barn. The barn stands on the road frontage. 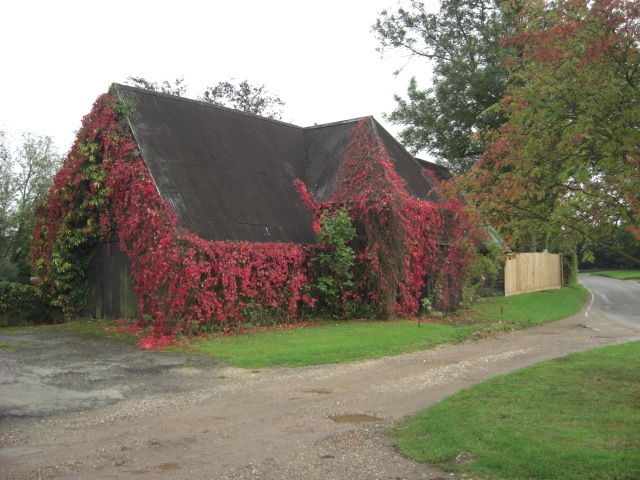 The draft Henham Conservation Area Appraisal highlights its role as a landmark building at the entrance to the village and the Conservation Area, and notes that it is in a dilapidated condition. It was until recently very overgrown with ivy. It is very close to the farmhouse, its south-east corner only being a few paces from the north-west corner of the house. The barn at one time formed one side of a yard behind the house. The 1840 tithe award for Henham indicates that the farm was owned and occupied by John Houghton (ERO D/CT 176B). He had just over 7 acres, comprising an arable field of almost 5 acres, an orchard, and the yard and garden round the house. There was too a cattle pond, now dried up and largely infilled. The 1841 census shows that John Houghton and his wife, Sarah, both aged 55, and Rebecca Houghton aged 20 were living there. Whites Directory for Essex for 1848 lists John and Joseph Houghton as farmers. Kellys Directory for 1862 lists Joseph Houghton amongst the farmers, presumably operating from Birds. 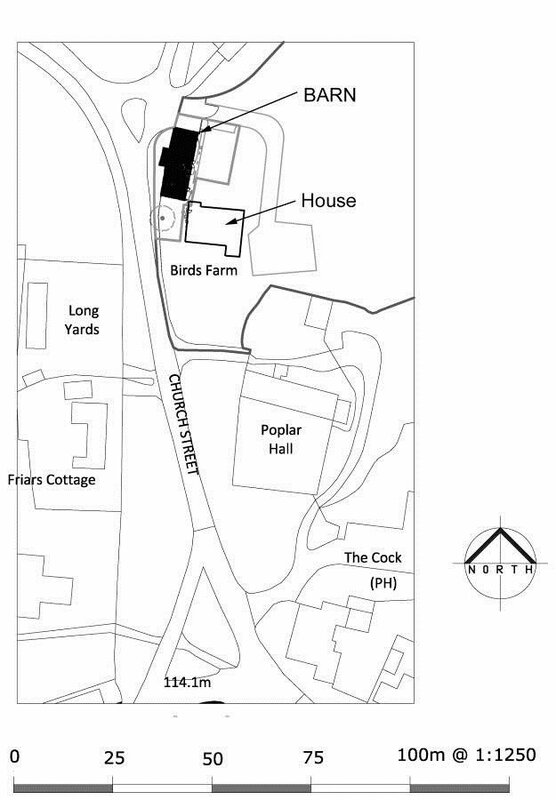 Maps of the 1840s show that the house was larger, with a wing attached to the front, and the barn had been extended to the south. 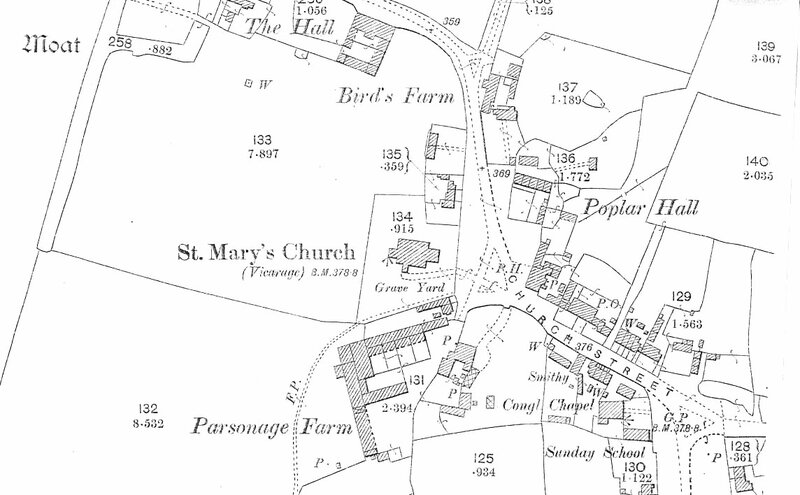 The 1st and 2nd edition OS maps of the 1870s and 1890s show the house without the added wing, and a range of outbuildings to the east of the barn forming a yard. The barn is said to have been used as a slaughter house at one time. By the beginning of the 20th century, the owners or residents must have ceased to be actively involved in agriculture. The 1901 census has Mary Ann Snow, a dressmaker, living there (www.henham.org/bygoneHenham). Sale particulars dated 1931 record that it was leased in 1917 by Russell Prichard to Joshua Grant, at a rent of £45 p.a. 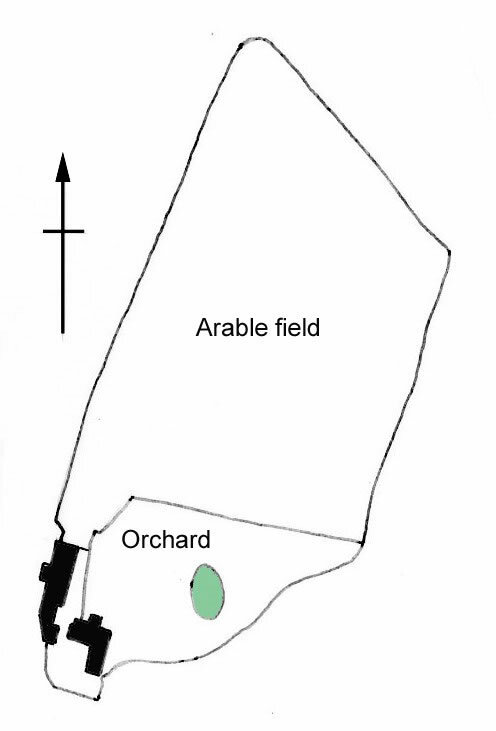 The property included an orchard, a pond, and a 4 ½ acre paddock (the former arable field), and was then known as Prestons, a name which seems not to figure in the records of the village. The present owners have lived at Birds Farm since 1990. The property is now about 2.5 acres in size. The barn is aligned north-south and of five unequal bays, with aisles. There is a midstrey or porch on the west side facing the road. It measures approximately 17m by 5.75m internally. The southern bay is a later addition. It is a well used and much altered structure, and presents difficulties of interpretation. The main posts are very eroded in places, the effect of wear and tear and storage, and are often deflected, the result of structural instability. 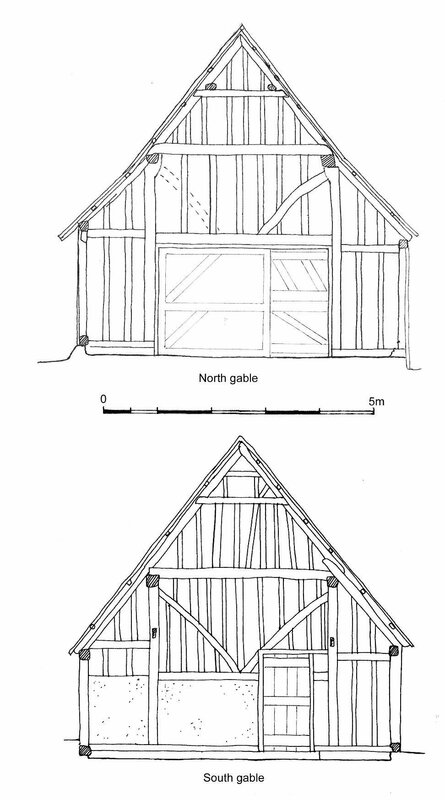 The general pattern of the framing of the trusses of the northern four bays is late medieval, 15th or 16th century. The arcade posts have (or had, as some have been removed) jowls. The top plates are extended in length with edge-halved scarf joints, which typically have a date range c.1350-1575. There are braces from the aisle ties to the arcade posts. The north wall has external tension braces above the mid rail. On closer examination, the frame displays little consistency. The second truss from the north has been inserted under the top plates. The tie-beam runs under them in what is known as reversed assembly. If this truss is put to one side, the bay at the north end of the barn to the midstrey is 5.4m long, almost 2m longer than the two bays to the south. 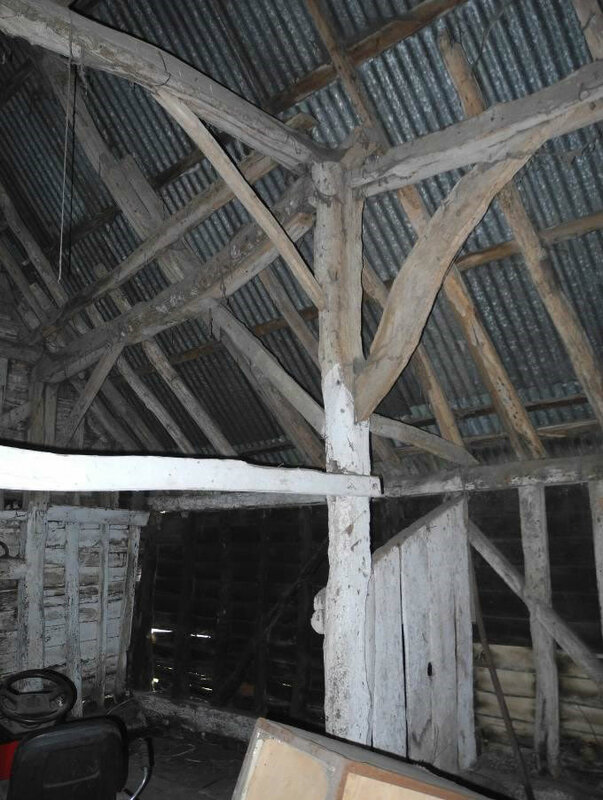 The truss might have been inserted to strengthen the barn, but against this, there are no signs of structural weakness at this point and the character of the truss resembles the others. On balance, it seems therefore that the truss was not an afterthought but original to the construction of the barn. The north wall includes some reused timber. The east arcade post in this truss has had the top of the jowl (which would have connected to the tie-beam) removed, and the top plate sits at the edge of the top of the post, in a way that suggests these members have been re-assembled and misaligned. The side walls, the aisle top plates and studs, are largely made of reused timbers, many of the recognisable ones being rafters. Typically studs have been inserted in the mortices in the top plates which they do not fit, being too small for them, and intermediate studs have been located between them, usually nailed to the top plate, the gap between the studs being about 1ft. This pattern is consistent in the two north bays on the east side. Elsewhere it is similar but with primary braces (i.e. braces around which the studs are fixed). The aisle ties are not a good fit to the top plate and are not dovetailed to them. The timbers of which the walls are made have wattling grooves, nicks and dowel holes for wattle and daub, but this is because they are reused. There are no traces of there ever having been wattle and daub between the studs, and it seems likely that the barn always had weatherboarded sides. In the gables, however, as in the southern gable today, there may have been lath and plaster. Because this gable has been straightened up where it has racked, there are two phases of lath and plaster here, the older possibly contemporary with the southern extension to the barn. The surviving weatherboarding all looks modern. The roof is of clasped purlin construction, made largely with reused rafters from a roof with collars. The steep pitch of the roof implies it was thatched. As so often happens, the thatch has been replaced with corrugated iron. 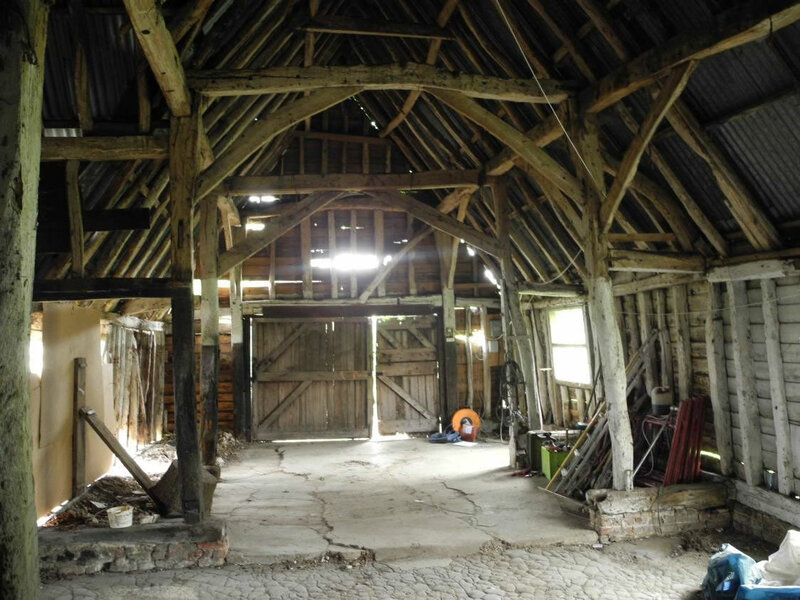 These features, when seen together, reveal that the barn does not have a consistent and systematically designed frame, even by the standards of later framing after c.1600 when reused timber was more widely employed. It is therefore concluded that the barn was built from elements of an earlier one and other reused timbers. The clasped purlin roof, and primary braced walls, point to a date around 1600 or in the 17th century. Some of the timbers in the midstrey, notably mid rails and top plates, are rather different and look purpose made, which would be consistent with reuse of timber from a barn which did not have a midstrey. The top plate of the south wall of the midstrey is of elm, as is the tie-beam of the 'inserted' second truss from the north. 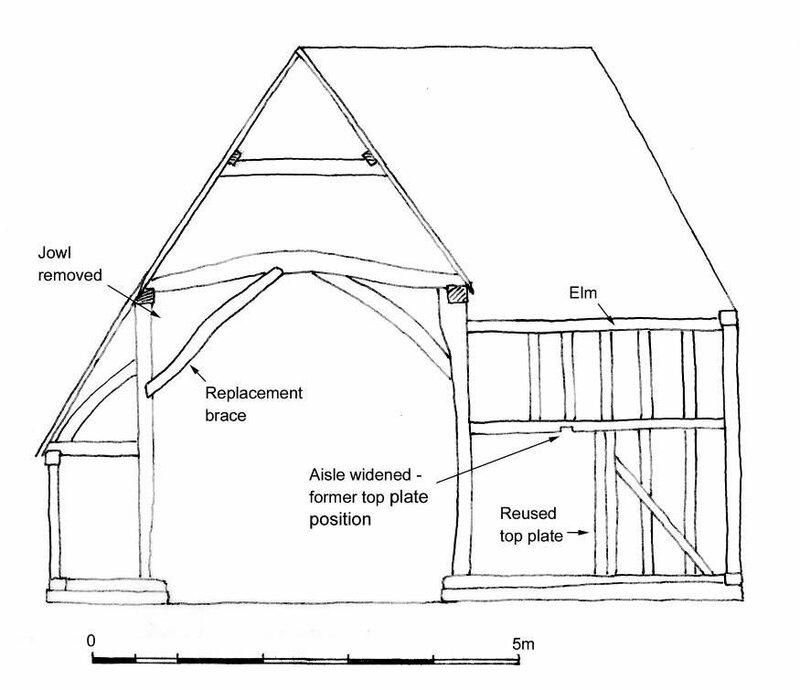 Elm was increasingly used in Essex timber frames from about 1600. The south bay is an extension. Its top plates have been added to those to the north. On the west side in this bay, there has been subsidence and the top plate has dropped dramatically. The posts in the south wall do not have jowls and there are large primary braces, features characteristic of later timber framing. South of the midstrey, the west aisle has been rebuilt and widened. The aisles at about 900mm wide are narrow. Here it is now 1.4m, though whether this was done to increase capacity or because this part of the barn was in need of repair is uncertain. The original position of the aisle top plate can be seen where there is an empty housing for it in the mid rail of the midstrey. The aisle top plate continues into the southern bay and so this was done when, or after, the barn was extended. These alterations probably occurred in the late 18th or early 19th century. The barn was primarily used for storing sheaves of corn and other produce which would have been stacked high into the roof. In the midstrey there were full height wagon doors. Originally there was a smaller door on the other side of the barn where there is now a window, and this central bay was probably used for threshing. The midstrey doors were later lowered in height, wide doors were inserted in the north wall, and a small one in the south wall. These doors are 19th or 20th century, and relate to the wider, non specifically agricultural, uses to which the barn has been put in recent times. Of these, the best attested is stabling for horses. In the second half of the 20th century, there was a riding school based in it. 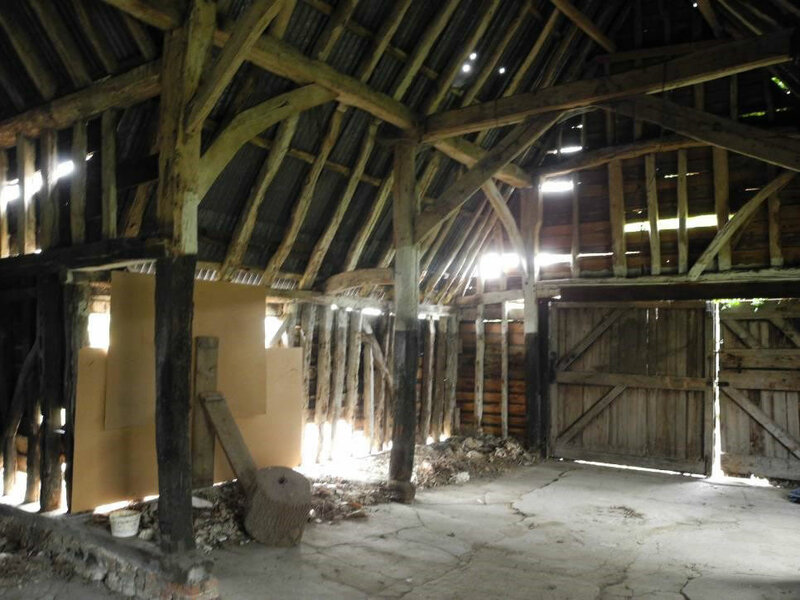 The southern part of the barn had partitions for stalls, and the walls were rendered to a height of about 5ft. 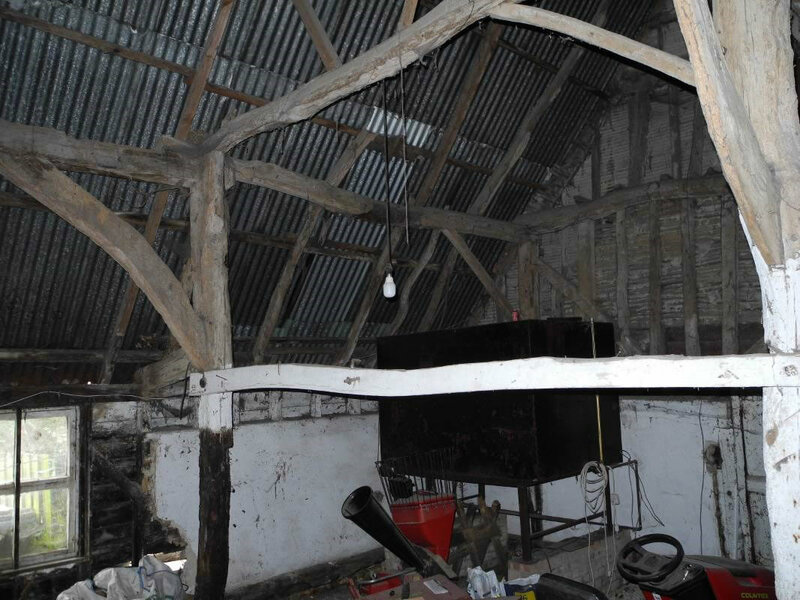 The partitions and render had almost entirely been removed at the time that the barn was inspected. A concrete floor was laid in the north and south halves of the barn, replacing an older asphalt one which survives in the midstrey. In the south half, there is a crude shallow drain in the concrete for the stables. It was probably in the 1970s or 1980s that the three wooden windows were inserted in the east wall, a clear reflection of the different uses to which it was being put. Three bay barns are a typical feature of small yeoman farms or cottages on smallholdings dating from the 16th or 17th centuries. The Birds Farm Barn seems to fall into this category, having these proportions even if technically of four bays. It is also not unusual for barns to incorporate reused timber and indeed to be assembled from elements of earlier buildings. 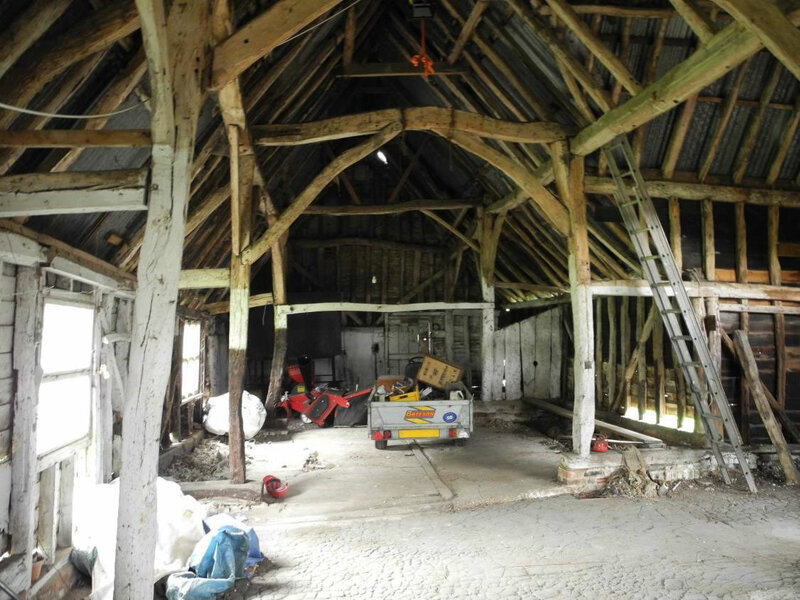 The barn at Birds Farm is probably much the same date as the house, the best estimate for which is c.1600. Originally this was quite small, comparable in size to the numerous cottages of the period, though built of substantial timbers and unusual in being jettied. 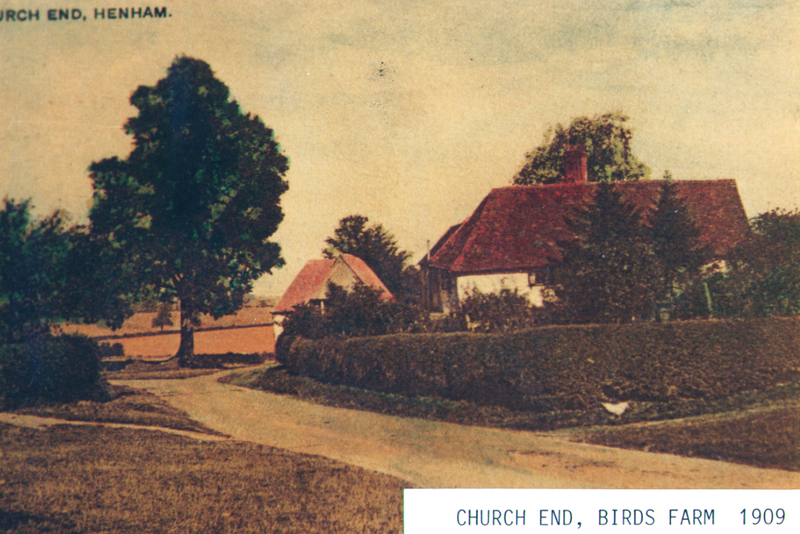 The land with it (in the 19th century) was also little more than the 4 acres that a statute of 1589 said should be provided for the support of such cottages. If this speculation is correct, then the house was probably the first on the site and the elements reused in the barn came from elsewhere. Both barn and house were extended in the 19th century, which could be taken to imply that both the type and scale of the operations being carried on there had changed considerably. It would be reasonable to conclude that the Houghton family who lived there at that time were farming other land as well. Acknowledgements: The owners, Simon and Wendy Maddox, are thanked for their assistance, and Richard Havis of Essex County Council Place Services for monitoring the work through the planning system.